This guide is intended to help provide basic sound to openSUSE users whose sound does not work at all after a new openSUSE install. This guide is not intended to show how to install codecs. Not all of the steps in this troubleshooting guide will be necessary. Just work your way from STEP-1 to the end, stopping when your audio starts to work. This guide is written generically. It has the greatest likelihood of helping a user if they do not deviate from the nominal openSUSE packaged drivers; desktop and kernel. That is, if one installs a custom kernel or updates to a factory KDE version (as opposed to remaining with the nominal KDE version), or applies a manufacturer-provided sound driver, there is an increased probability that this guide will not be of help. After openSUSE installation, in some cases it is necessary to adjust the audio  settings in order to get sound. For some sound codecs, the RPM "alsa-firmware" (which is not installed by default) is needed to provide sound functionality. In other cases where the audio hardware is newer, a more up-to-date version of ALSA is required. 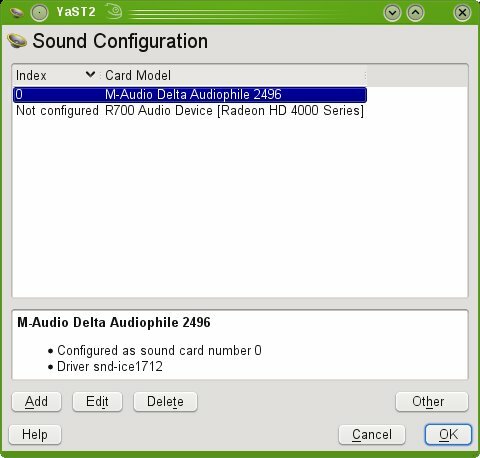 Due to the very large number of audio cards on the market, sometimes YaST may not able to configure the card automatically, and hence manual configuration is necessary. Since openSUSE 11.4, KDE has had PulseAudio installed and active by default. Gnome has had PulseAudio even before then. In such a case, it can be useful for KDE users to install the application PulseAudio Volume Control (pavucontrol) and use that application to tune one's audio for each multimedia application. Gnome users may find pauvcontrol already installed by default. LXDE users will find that they will first need to install PulseAudio (as PulseAudio was not automatically installed in LXDE as of openSUSE 12.1 and earlier), and subsequently install pavucontrol. After it is installed, type "exit" or press CTRL+D to close the root session. Then, to run pavucontrol, type "pavucontrol". The first time you run each application, tune PulseAudio for that application, ensuring you have each application tuned to use the correct audio device. Note that openSUSE ships with ALSA (Advanced Linux Sound Architecture), which is also installed by default. Users are given a chance to configure this during the openSUSE installation. 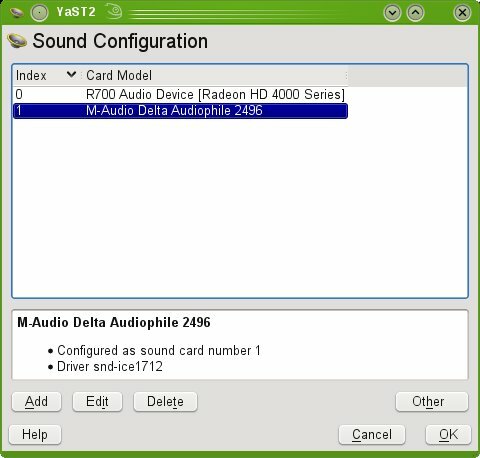 Starting with openSUSE 10.3, some of the older sound cards also require the “alsa-firmware” package in addition to “alsa” and “alsa-utils”. Thus, before proceeding, ensure that you have “alsa”, “alsa-utils”, and “alsa-firmware” installed. It appears that installing the alsa-firmware package may help users with: asihpi (dspxxxx), ea (gina, indigo, layla, mona), emagic (emi), ess (maestro), mixart, multiface, pcxhr, sb16, vx, yamaha, and some other chipsets. then alsa-firmware is not installed. It is useful for openSUSE 10.3 users — and possibly essential for some hardware codecs — that you install it now. For other openSUSE versions, the ALSA versions will differ slightly. Note that Linux is case sensitive, and “D” is not the same as “d”. While the konsole/xterm has mouse focus, hit CTRL-C to stop the test. Note that you should check your mixer settings (alsamixer in the terminal, though graphical programs like kmix may also be used) to ensure that PCM and Master Volume are not muted. If need be, raise the sound levels and retry until you hear sound. Note that the test for surround sound is different. If there is no sound from either test when using a konsole (or xterm) as a regular user, try as user root, i.e. type su and then try the test line. If you get sound with root permissions, but you got no sound as a regular user, then you probably have a permissions problem. See below in Step-6 for how to deal with that. Assuming you have no sound at all, go to step-2 below. and configure your sound. Do NOT try this on openSUSE-11.2. After configuring test your sound, and don't forget to check your mixers (kmix or alsamixer as appropriate). If there is still no sound, go to step-3. It is often useful to find out more about your sound configuration before proceeding. Then for this example, we are interested in the ALC650. If that does not provide the codec, then another approach to obtain more information on your hardware and your sound configuration, is to run the following script. Often the first time you run this script, it will note there is an update available, and ask if you wish to update. Select YES. If you are running this in a terminal/konsole with root permissions, the script will update. Then run the script a second time. When it is complete, it will pass you a URL. Take a look at the contents of the URL, as it passes to you useful information. Also keep a record of the URL provided by the script as it can come in useful for passing to others who are trying to assist you (on one of the forums, or on an IRC channel). Then go to the next step of this guide. Keep a record of the URL provided by the script as it can come in useful for passing to other's who are trying to assist you (on one of the forums, or on an IRC channel). For those who find the above instructions on running the two diagnostic scripts too challenging, then as a regular user try copying and pasting each of the two lines below (one at a time) into an xterm/konsole to both download and run the scripts. Copy the COMPLETE line. The second one (tsalsa) will prompt for root password. If, for example, your openSUSE has alsa-1.0.14, from that one can see that there were many updates to the ALC268 between alsa-1.0.14 and alsa-1.0.15, which is relevant in this example case. There may be further updates in alsa-1.0.16. Doing a search on that page will indicate many changes with this new alsa version for ALC268. In that case, one should consider updating to alsa-1.0.16 (see below for hints on updating to alsa-1.0.16). If updating alsa is deemed necessary, then this can be done either via rpm or via a tarball. As always, the average openSUSE user should typically try updating via an rpm first, prior to trying via a tarball. For openSUSE, the openSUSE alsa packager / alsa developer also packages the latest alsa as openSUSE rpms, in order to help users whose sound is not functioning appropriately, by providing cutting edge sound drivers. The rpm applications that are typically updated include alsa, alsa-utils, alsa-tools, and libasound2 alsa-firmware. Note alsa-firmware is in the “noarch” section of that rpm URL. In addition, there are ALSA driver kernel modules to update. It is often easiest to add the URL of the repository noted in the next section to one's package manager, and install the rpm applications through one's package manager. The examples in the above URL are important, PLEASE check out that link to see the exact rpm/zypper installation commands you need to use. Again, this is IMPORTANT. Also note, for these "cutting edge" alsa rpms to install without dependency problems, you should ensure you have updated to the latest kernel for your openSUSE provided by, and recommended by Novell/SuSE-GmbH. If you chose not to update to the latest kernel, then you will need to modify the zypper commands, making reference to a different repository directory, that supports your PC's older (original) openSUSE-10.3 kernel. For all openSUSE users, after installing this latest alsa, its easiest to reboot (to reload this updated alsa driver) then again go through all of the previous steps in this page, to see if you can get your sound working under the new alsa. Note one may still not have sound, and you may need to edit your /etc/modprobe.d/sound file (see STEP-5 below), and add a model specification. Also, if the above alsa update restores your sound, then be careful about applying further updates of alsa. The alsa rpms on this web site are very "cutting edge", they are built regularly, and they could have recently introduced bugs that have not been fixed yet. Hence once you get your sound working, you should remove this "cutting edge" multimedia repository (while still keeping the installed rpms). One can also custom compile alsa for their PC by going to the URL below and downloading the alsa tarballs alsa-driver, alsa-firmware, alsa-lib, alsa-utils, and alsa-tools: http://www.alsa-project.org/main/index.php/Download A note of caution, ... this sort of update via a custom compile of alsa from tarball is typically not for new users. Try instead to follow the rpm update method via zypper command, described above. The same is true for most sound modules. Once alsa is compiled and installed, restart one's PC to load the sound module, then again go through all of the previous steps in this page, to see if you can get your sound working under the new alsa. Note one may still not have sound, and one may wish to modify their /etc/modprobe.d/sound file per the recommendations of the alsa page, or one may wish to try and edit to their /etc/modprobe.d/sound file (by adding a model specification) as noted below. As of 1.0.19 of alsa, the HD-Audio-Models options are listed in the HD-Audio-Models.txt file. Now go into your /etc/modprobe.d/sound file (/etc/modprobe.d/50-sound.conf on openSUSE-11.2) and look for a line that looks something like: "options snd-hda-intel enable=1 index=0" and add a model specification on the end of that line. If you last attempted to configure your sound with "alsaconf" (on openSUSE-11.1 or earlier), its possible there will be no line at all like that, in which case you will need to add a line similar to the example below. For the ALC268 codec, if you clearly have an “acer” or “toshiba” laptop computer, then the choice as to what you can try first is clear. But its still possible one of those will work with your audio, even if your hardware is not that of an “acer” nor “toshiba” and you should iteratively still try those models. Then test your sound with the sound test provided at the start of this web page. Don't forget to check your mixer is not muting nor blocking the sound. If that doesn't work, then edit your /etc/modprobe.d/sound file again (/etc/modprobe.d/50-sound.conf on openSUSE-11.2), trying the different options (ie “acer” and “3stack”) being certain to restart your alsa between each edit. You need to determine how many jacks your hardware has (take a look) to see if it is applicable to try the 3-stack, or the 5stack, or the 6-stack, or an S/PDIF output interface ... then you may be able to narrow down what options you try, to find the optimal setting earlier. And then try each of the model options by adding "model= ...... " to the /etc/modprobe.d/sound file (/etc/modprobe.d/50-sound.conf on openSUSE-11.2). Don't forget to restart alsa after each attempt. Warning! Don't put any backup files of 'sound' (or backups of anything else) in /etc/modprobe.d/ as this would also be read and loaded! Put your backups somewhere else. In some cases user root will have sound, but a regular user will not have sound. Typically this is due to a permissions problem being experienced by the regular user. HAL/ConsoleKit/PolicyKit will automatically grant permission to the user by adding appropriate ACL entries on /dev/snd/* (and other device files) for local logins(you don't want users logging in remotely play sound on your box, really) — console, gdm, kdm. With one exception: xdm lacks PolicyKit support as of Xorg 7.4. The new group membership will be available to processes started from the next login. On openSUSE-11.1 and 11.2, PulseAudio works much better. In other cases, choppy sound in pulsaudio can result from wrong settings for the sample rate in /etc/pulse/daemon.conf . Try changing the line default-sample-rate = 44100 in /etc/pulse/daemon.conf by default-sample-rate = 48000 and restart the PulseAudio server. First, start up YAST and open up the "Sound" module in the "Hardware" section. If there are multiple sound devices, they'll be listed here. The "Index" column starts at 0 for the first sound device, then 1 for the second, 2 for the third, and etc. In some cases, the wrong device may be set as index 0, which would cause sound problems in many applications. The goal is to have your preferred sound device as index 0 to make sure all applications use it as the default. You can do this by selecting each sound device, then clicking the "Delete" button at the bottom of the window to delete each device's configuration. This changes that device's Index to "Not configured" and moves it to the bottom of the list. Once they've all been deleted, select your preferred device (the one you actually want to hear sound from) and click the "Edit" button to configure it. If it was already configured automatically during openSUSE installation, then choosing "Quick automatic setup" in the next window should work fine. Once configured, that device will be at index 0 and at the top of the list. You can choose to leave any other devices un-configured, or you can configure them too in case you ever intend to use them. In my case, I don't ever intend to use my video card's HDMI audio output, so I left it un-configured. If you're not sure which device is the one you want first on the list, then try each one at index 0 until it works, one at a time. You may have to log out and log back into your account to make sure the changes were successfully applied after each attempt. For the "id" to use, see the output of "aplay -l". KDE3 users can following the following to obtain guidance for configuring their USB headphones: SDB:USB_headphones KDE4 steps may differ. If one runs the above line at different times, when one's sound is working and not working, one can learn better as to what the output means, and be better able to " point one's finger " at the offending application that has seized the audio device. This page was last modified on 27 October 2018, at 07:23. This page has been accessed 238,294 times.